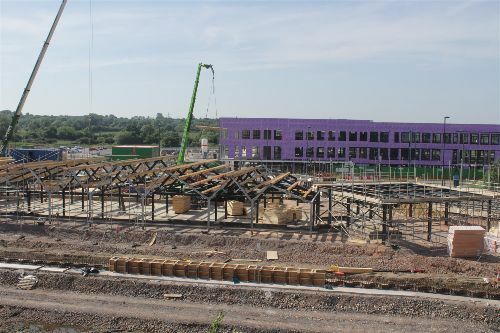 Lots more construction activity on site this month with the Hall and Woodhouse pub structure now well advanced and its distinctive roof line already on show. The Deanery CE Academy building is also progressing well with the windows starting to be installed in the east wing and a last bolt ceremony held to mark another important milestone in the build. Despite being personally invited via twitter Usain Bolt unfortunately couldn't make the ceremony, but Linda Culling the schools principal did the honours and attached the final bolt. In the canal the sheet piling is now complete and work has started on the concrete capping beam. North of Foxham Way bridge the western bank is being constructed slightly differently with a softer, more natural approach. Over the next month the edge will be built up using a modular system that looks a bit like sandbags providing extra stability to the bank as well as allowing vegetation to grow. Finally, it is worth mentioning the least visible of our construction contracts, the new road through Canalside continuing south from the Foxham Way / Peglars Way junction. Fox Owmby who are delivering the road have been doing a sterling job trying to coordinate all the services and ensuring the gas, water, electricity and telecoms are all in the right place at the right time whilst maintaining the access to all the other works. This has caused a bit of disruption as some of the services cross sections of road that are open to traffic. Our thanks to everyone who has been bearing with us whilst restrictions have been put in place. Click here to see the latest time lapse video. Design work is continuing on both housing parcels to be delivered by the Joint Venture, as well as further development within Canalside in the background. Two of these applications are now however at the planning submission stage with the landscaping around Peglars Way out to consultation and the Primary School application due to be submitted shortly. You can read about the landscaping works here, with more details of the Primary School to be added to the latest news page shortly. If you are walking around the wider site you may also have seen the start of the next phase of great crested newt clearance works. Over the next month fencing and traps will be installed and our ecologists will be collecting and relocating the newts to one of the receptor sites within Wichelstowe. These works can only be done at certain times of the year and are controlled by licences issued by Natural England. We regularly survey the site and keep track of the number of great crested newts by scanning their distinct belly patterns. The current clearance works will allow us to start work on the Joint Venture housing parcels as well as improvements to the landscaping areas which surround the site as soon as we are ready. Finally, this month saw some new arrivals for the swans who have been nesting along the canal just south of Skew Bridge. Whilst the herons are still our favourites, these fluffy cygnets are a close second.